Brad Woolridge runs the Flame of Hope with UAE athlete Chaica Al Qassimi. On February 28th the long journey had begun. The Law Enforcement Torch Run (LETR) representative for the state of Kentucky, Detective Brad Woolridge was on his way to Abu Dhabi. 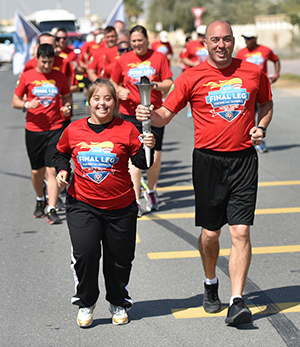 The goal of LETR is to raise funds and awareness of Special Olympics. This journey had been almost two years on the making. The trip over would be long and the days in country even longer, Brad told us that some days started as early as 6 am on the bus and wouldn’t return to the hotel till as late as 11:30 at night, but it was still a once in a lifetime opportunity. Detective Woolridge has been a long time supporter of SOKY including friends and family any time he can. The trip would last almost 18 days with the LETR program traveling all 7 emirates, running the Flame of Hope over 122 miles while being carried by over 110 law enforcement officers from 24 countries.